Here is the example of ECOLINES bus ticket. Carefully examine its content as there is important information about your journey. Printing out ticket unassisted from website or receiving your ticket in agency, make sure it is printed out in that language which you understand better. At the moment ticket is available in 8 languages RU, LV, EN, DE, PL, EST, LT, and BG. If you have any questions do not hesitate to contact ECOLINES offices. In brackets contact phone number (to inform about possible changes). Date and time of departure of outward journey (local!). Information about bonus points (if you are a member of Bonus program). If no, you should certainly join it, it is profitable! 3 Points of departure and arrival, in brackets transit countries. 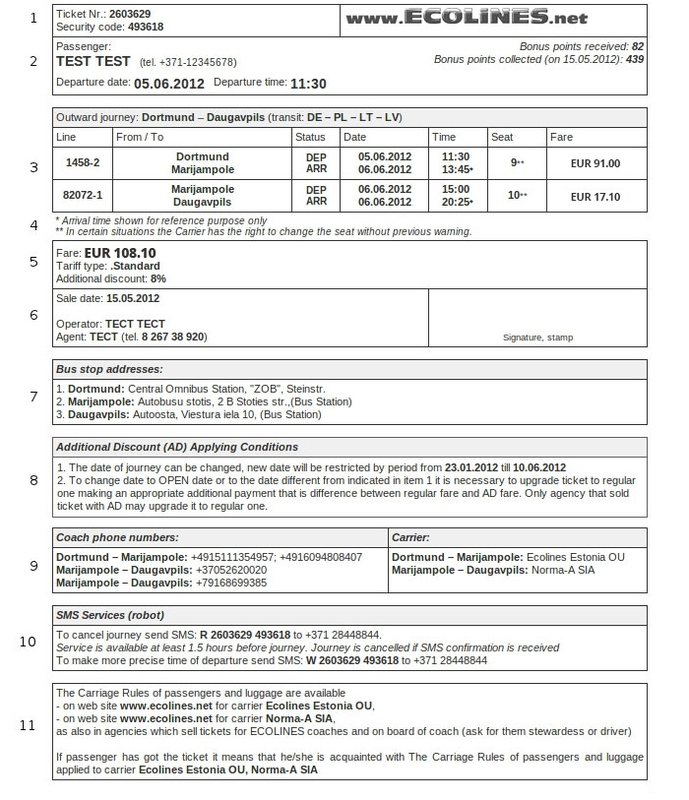 Line number, points of departure and arrival, possible changes of bus (may not exist), date and time of departure an arrival, seat(s), price of each journey’s segment. 4 Note about possible changes. 5 Full ticket price in currency of purchase. Additional discount (may not exist). Agent’s signature and stamp (not needed for online tickets). 7 Bus stop addresses in departure, changing and arrival points. 8 Conditions of additional discount (AD) if applied (may not exist). Phone number on board in each journey’s segment (may not exist). Carrier’s name in each journey’s segment. 10 SMS service (cancel journey and precise time of departure). 11 Information about carriage terms and conditions availability and getting acquainted with them. Possible other carrier’s additional information. Or bus stop scheme if changed recently.